Until today, I used to feel sorry for my brother because it was obvious to me that he was the tortured soul in our family. My brother’s name is Adam, but we call him "Poor Adam I Really Feel Sorry For Him It’s A Shame”. That is a long name. Sometimes we shorten his name to just Poor Adam. I am convinced that he will never find peace because, after all, he is a tortured soul. Adam finds angst relief in chemical form. It used to be heroine. One time he longingly and lovingly described to me what it felt like as the drug hit his veins. While he was telling me, he had a slight smile and a faraway look in his eyes like someone who was reminiscing about good times with an old friend. Adam, at 52 years of age, pretty old for a drug addict, still has thoughts of becoming a famous rock star playing his guitar for the crowds. You could call it delusions of grandeur or are they perhaps as yet unfulfilled dreams? 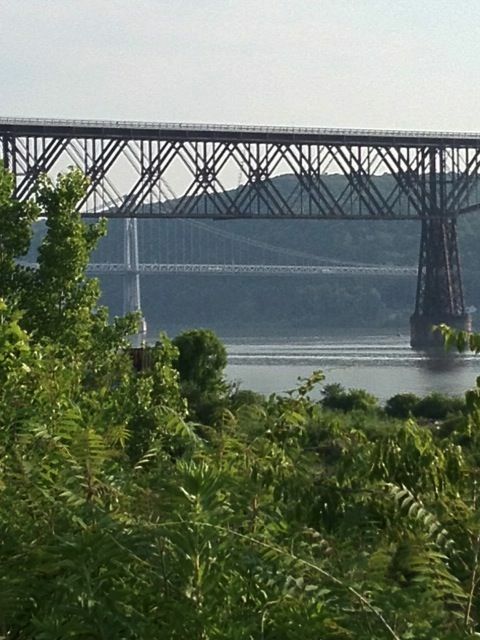 As Ross and I were touring Someplace Else, he pointed this bridge out to me. The bridge was very high up and from way down below I could see people walking and biking across the bridge. As we drove around the Someplace Else area, the bridge seemed to be in constant sight; teasing me, tempting me, daring me. Now that we are back to where we usually are, I keep thinking about that bridge. I keep wondering what it might have felt like to look down from way, way up. I also wonder what it would feel like to look up from that high up. How far would I be able to see, if I looked way, way out? What’s on the other side? As I imagine myself on the bridge, I can feel the excitement and nervousness in the pit of my stomach. And I realize that I must have experienced that feeling once upon a time. I wonder what really stopped me. Maybe it was Life’s many recent cruelties which haunt me with reminders of just who is in charge here. Perhaps Adam and I are more than brother and sister. Perhaps we are tortured soul mates. Sadly, I suspect that Poor Adam’s angst will continue to be momentarily and temporarily relieved day by day. I can’t help but wonder if Poor Adam would just be Adam today if someone along the way had encouraged him to play his guitar because he is good, really, really good. As I meander through my thoughts and write them here in this post, I have come to understand that my soul might be a little less tortured right now if I had succumbed to the taunts of the bridge. So today, I am going to make a promise to myself. 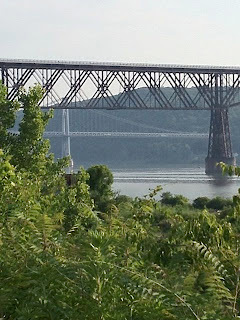 I promise that the next time I write about that bridge I will be lovingly and longingly describing the feeling I got as I walked out over the Hudson River and looked way, way out as I made it to the other side and back again. And who knows, next stop might be tightrope walking over Niagara Falls. That’s right just call me "Flying Walynda”. Ordered awnings for the house from Bambergers. Marie having her birthday party tonight. Did not go. No one to stay here with Baby. Sent our gifts over with Jean. Dinner at Mrs. Naps. Visited Mrs. Poole with Jean. Later went to Cemetery. Home about eight. Bill with Baby. Peg & Jean came to Mt Prospect. Jean’s vacation over tomorrow. Walking across the Golden Gate freaks me out. I did it far more readily when I was younger, much younger, and I remember walking at least part way across with my children when they were about 3 and 5. That's the last time I have ever wanted to walk on it - something very frightening about it. I can't look down. I can't stop imaging the many people who have taken their lives from that span. And it is so easy to imagine the leap over. It is easy to imagine that I will lose control with myself and impulsively leap off. So I can't walk on it anymore. I had to walk over the Queensboro bridge on 9/11 and watched the city burn. I recall that walk over with such sadness. I then had to walk over it when we had that black out in NYC a few years later in Aug and walked to my apt in Queens in the heat. I have told everyone who would listen that if I ever have to walk that bridge again, I am moving! I wish peace to your brother. My brother suffered and couldn't ever break his addiction and he is no longer with us. It is the saddest thing not to be able to "help" them, as they have to do it themselves etc etc..and yet, as a sister, it is hard to watch. All the best to you..